G13 Gallery, GL13, Ground Floor, Block B, Kelana Square, Jalan SS7/26, 47301 Kelana Jaya, Selangor. 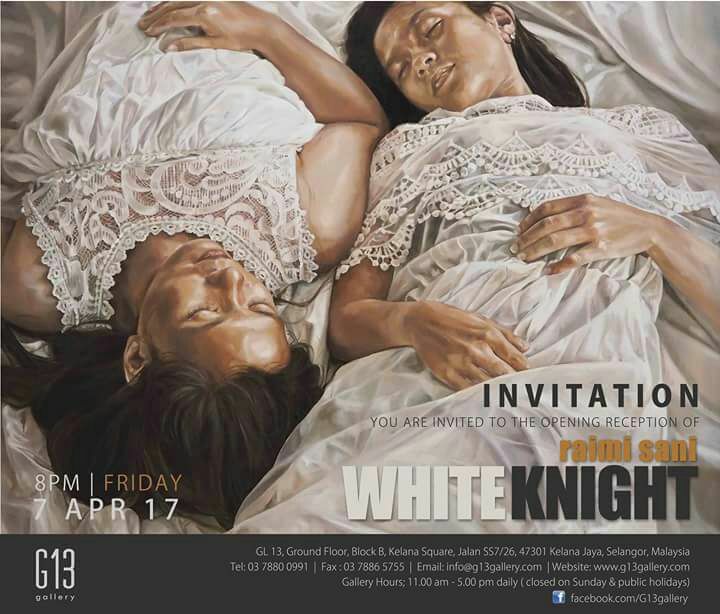 Emerging female artist Raimi Sani will hold her debut solo show, White Knight, at G13 Gallery. Raimi's paintings first appeared at G13’s Project Room showcase last August. Twelve of her recent paintings will be shown in this solo exhibition. It is said that the works highlight her soul-searching journey as an individual and artist. ‘White Knight’ is a metaphor that relates to the artist’s "self-representation in dealing with her dilemma". This exhibition offers the audience the opportunity to glimpse into the mind of the artist. There's an opening reception on April 7. Contact the gallery for more details.